When I began working on the Doepker genealogy, I thought it was going to be a similar process, but I could not have been more wrong. For one thing, when I began work on the Gorman genealogy, the Internet was in its infancy. Additionally, doing genealogical research for German ancestors is significantly easier than for the Irish. While Germany has seen its fair share of social and political upheaval in its history, these events have not conspired, as in Ireland, to obliterate much of the genealogical history of its populace. That said, there are difficulties inherent in researching any locality far from home, where few records have been made available on this side of the Atlantic. Then there is the barrier of language. While technology does much to bridge these obstacles, there is no substitute for the impact that direct communication can have. I owe a debt of gratitude to more than a few people in helping me piece together this history. 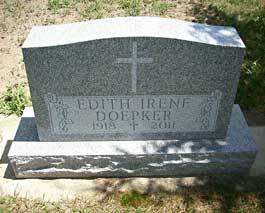 In many ways, this story is the story of my grandmother, Hilda Doepker. That she should survive well into her eighties with the staggering number of physical problems that plagued her throughout her life pays homage to the stout character of the German people from whom she is descended. 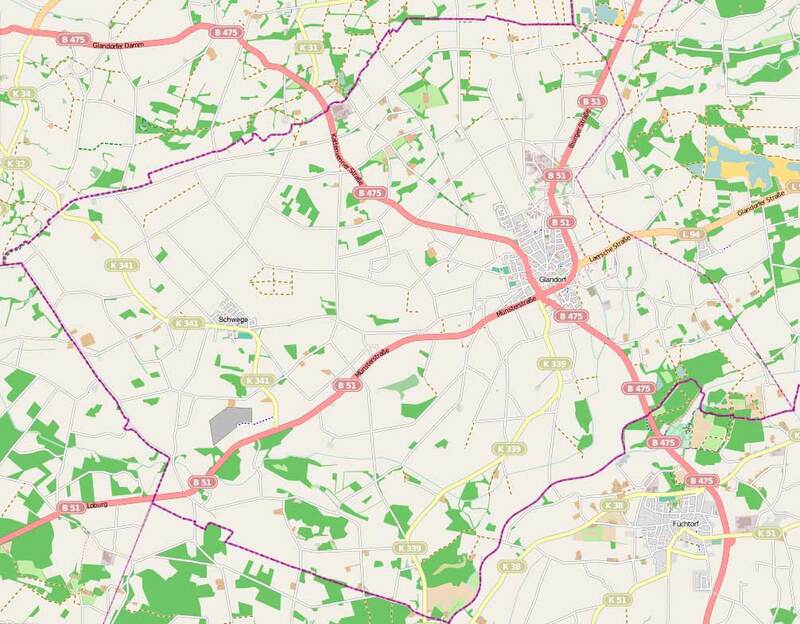 The eldest know ancestor in the Doepker lineage is Heinrich Döpker, who was born in approximately 1635 in municipality of Glandorf, District of Osnabrück, in what is now the state of Lower Saxony, Germany. It was the middle of the Thirty Years War, a time of great strife amongst the member states of the Holy Roman Empire set off by the Protestant Reformation and a number of minor rebellions. The war was devastating as marauding armies of various nationalities swept through the region, often living off the inhabitants of whatever area they occupied. The result was a significant reduction in the populace due to famine, plague and economic hardship. The area was occupied by the armies of Sweden's King Gustavus II from 1631 to the end of the war, occupying the homes of the local populace, living off their production, demanding "war taxes" and, in 1636, burning down their church. The 1648 Peace of Westfalia brought an end to the conflict and with it, better times to raise a family. Heinrich took a wife, Gertrude (her surname is unknown) around 1662 and the two raised three girls and five boys, all born between 1663 and 1684. 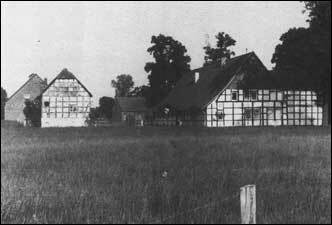 The area the Döpkers lived in was near the small farming village of Schwege. 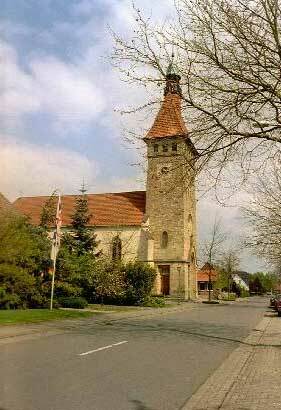 The inhabitants of Schwege were largely Catholic, as were the Döpkers, with some Protestants, though the town would not have its own Catholic parish until the 19th century. 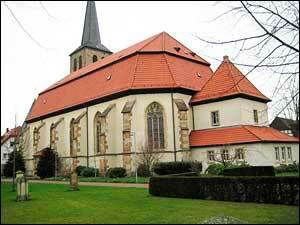 The Döpkers were members of St. Johannis (St John the Baptist) Catholic Church in Glandorf, first erected in 1270. 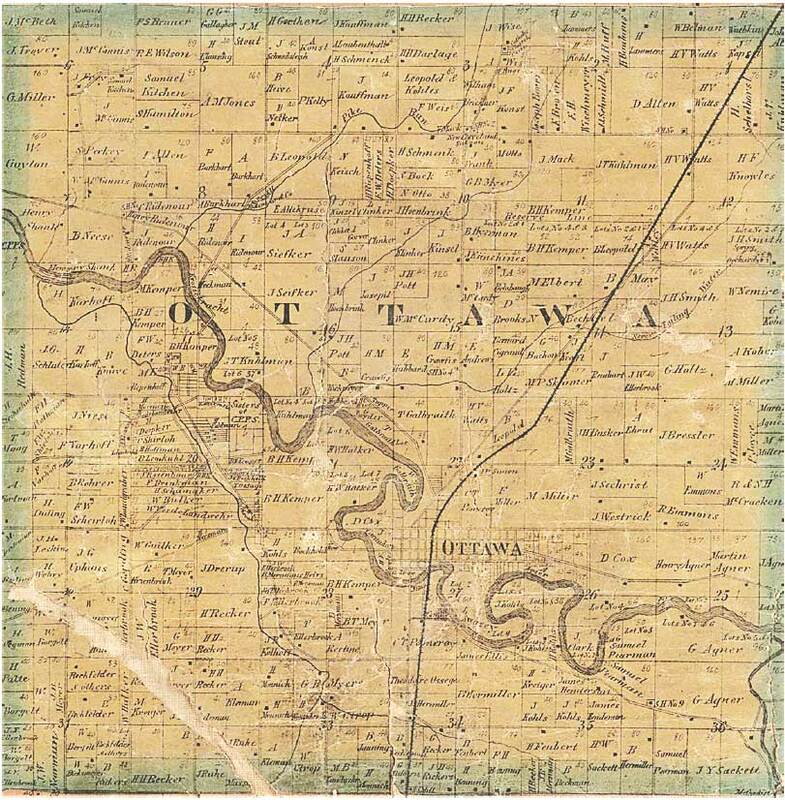 The first survey of the area in the 18th century described a land variously divided between farmland, woods, and heath, with smaller areas of meadow, grassland, and a large swamp to the north, which was later drained and converted to grasslands. At one time in the distant past, the area would have been almost entirely wooded, but centuries of human habitation had converted most to support the population. The soil was fairly sandy, having been the bottom of an ancient seabed in the distant geological past. Less than one quarter consisted of productive, fertile land, well-suited for raising crops. Much of the rest served as forage for livestock. Field crops consisted mostly of rye, oats, buckwheat, flax and hemp with some beans and turnips. Much of the farming would have been of a subsistence nature. It would be 300 years before the land would be sufficiently enriched to grow much else. One of Heinrich Döpker's children, his youngest, also named Heinrich, married Anna Catharina Borgelt in 1713. Only two children were known to have come of this union, but it is possible that more were born but did not survive. The period between 1719 and 1731 was characterized by a number of epidemics that swept through the area, preying mostly on the oldest and youngest. At the time, feudalism was the prevailing norm in Europe, with all land being held by the gentry, or noble class, with a strictly stratified class system down to the lowest peasant. The Döpkers occupied almost the lowest rung of this system. As "Heuerlinge" (literally "hirelings"), they lived and worked on the farms of the land-owning class. As such, they had no right to vote, paid the landowners with their labor to live in oft times squalid rooming houses or shacks, sometimes with a dozen or more other families. It is not hard to imagine how disease would have swept through a population in such close proximity to each other. The Heuerlinge were usually allowed to rent a small strip of the least productive land to raise crops for their own subsistence. This system persisted until well into the early 20th century, when industrialization and prospects of a different life overseas drew many away to a better life. The only surviving son of Heinrich Döpker (the younger) was Johan Heinrich Döpker, born in 1715. He married Anna Gertrud Laudick in 1737 and began raising a family. Four children are known to have survived. It was very rare at that time for families to move from one area to another, even through many generations. When they had come of age, sons and daughters often took over the same contracts with the land owners as their parents, resulting in a sort of indentured servitude whose cycle was hard to break. Heuerlinge children often began working for the landed farmers when they were quite young, in a never-ending effort to pay their families' debt. In the days before even the idea of social welfare or child labor laws would have been unthinkable, families had to stay together to support each other through sickness, hardship, and old age. The Döpker family lived as Heuerlinge in the eighteenth century on the farms of the Brandmann and Beermann-Köller families. 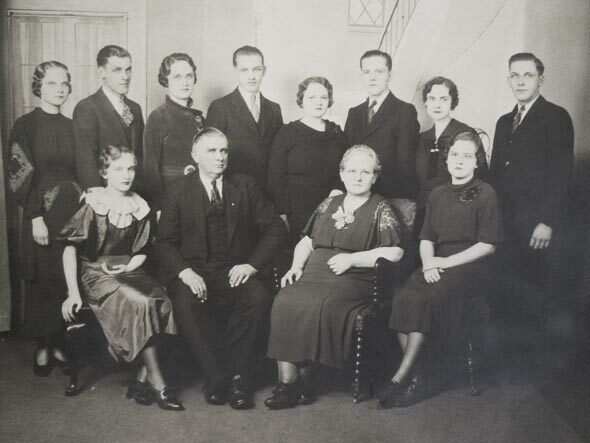 In the nineteenth and into the twentieth century, they were living with the Henneker and Reher families. St. Johannis (St. John the Baptist) Catholic Church, Glandorf, Germany Map of Glandorf, Germany, showing the location of Schwege. The Reher House, with the "Heuerhaus" (worker's house) at left. Image courtesy "750 Jahre Schwege" by Maria Bruggemann and Klaus Pusch. The youngest son of Johann Heinrich Döpker was Johann Dirck Döpker. Born in 1744, he would have grown up during the Seven Years War, which took place primarily between 1756 and 1763. Hanover, of which Schwege was a part, was in an alliance with Prussia and Great Britain against an alliance between France, Russia, Sweden, Austria and Saxony. The war had the effect of draining significant resources, in both men and material, from an already impoverished populace, as wars always do. The forces of Hanover battled the French, mostly unsuccessfully. As a result, the French occupied Hanover until the conclusion of the war by the Treaty of Paris in 1763. The scourge of war at last over, Johan Dirck Döpker was free to marry Maria Elisabeth Torwinn, in 1773, and have four children between 1774 and 1780. Alas, though the cloud of war had gone, the condition of their servitude had not improved much. Between 1718 and 1780, the proportion of Heuerlinge to inheriting landowners had changed little, growing from 49% to 51% of the population while the population itself grew by almost 59%. The class structure was severely stratified, as the system of inheritance had designated those in possession of land as landowners (Gutsbesitzer), full heirs (Vollerbe), half heirs (Halberbe), quarter heirs (Erbkötter), non-inheriting cottagers (Markkötter), half-non-inheriting cottagers (Halbmarkkötter), non-inheriting farmers (Neubauer), growers (Anbauer) and finally the Heuerlinge at the bottom. The control of the landed class extended beyond matters economic as permission had to be granted before anyone in their servitude could marry. The system of taxation was stacked against them as well, as the amount that was levied was based not on income or property, but by the number and size of fireplaces and the number of heads of cattle they raised. The resulting concentration of wealth required that the working poor give up significant proportions of their productive capacity to pay the landed class. The eldest of Johan Dirck Döpker's children, Johann Diedrich Döpker, born in 1774, saw many changes, but not necessarily for the better. He married Catherina Elisabeth Mirlenbrink in 1797. His six children, only three of whom are known to have lived past infancy, were born during the time of the French occupation by Napoleon's armies. In some ways, his family would have benefited, as a number of civil projects, including improvements to roads and waterways, undertaken largely to more effectively move French troops. This provided an additional source of income that was not beholding to the landowning class. In addition, the adoption of French Civil Law abolished the system of serfdom that had burdened the Döpkers and their like for centuries and adopted a progressive taxation system. All was not rosy however, as the taxes paid to the French were high and they had to suffer the continued scourge of occupation. Alas, when the French finally left in 1813 and the Kingdom of Hanover reestablished, the old feudal system was also reinstated. The Döpkers found themselves once again in the role of indebted laborers for their landed masters. When Johann Heinrich Döpker, born in 1811 and Johan Dirck Döpker's youngest son, came of age, it was in a much different world. Most importantly, there was land in the Americas that could be obtained without right of inheritance. At the end of the day, the fruits of the harvest, whether meager or bounteous, would be yours and yours to dispense with as you pleased. Passage to America represented a substantial risk for many and the cost of passage remained an obstacle. However, what existed for them in Hanover was more of the same, poor living conditions and backbreaking labor, for no benefit, they had known for generations. The end of French rule had left economic hardship with the loss of many former trading partners, chiefly the British. It would be decades before the economy would shift from an agricultural base to industry, as was happening in other areas of Europe. During this time, many farms failed. 1830 and 1844 are marked as years of famine. While the tax burden on the poor had eased somewhat with the institution of a property tax in 1817, wealth remained with the nobility and would stay so until after the First World War. The Beermann-Koller House, in Schwege, Lower Saxony, Germany. Image courtesy "750 Jahre Schwege" by Maria Bruggemann and Klaus Pusch. St. Marien's Catholic Church in Schwege. 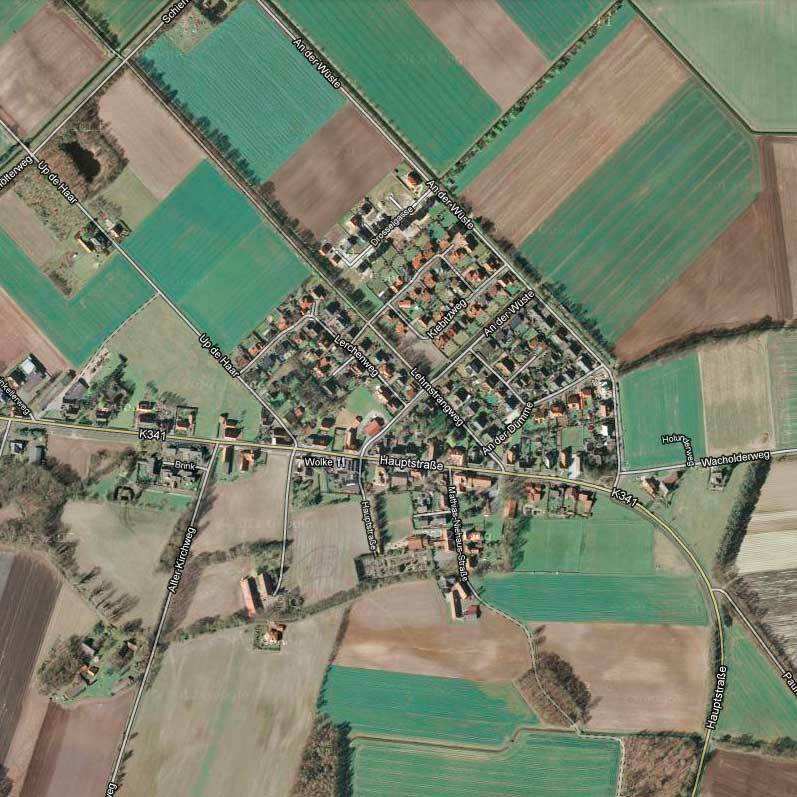 Satellite image of Schwege, Germany. Image courtesy of Google Maps. 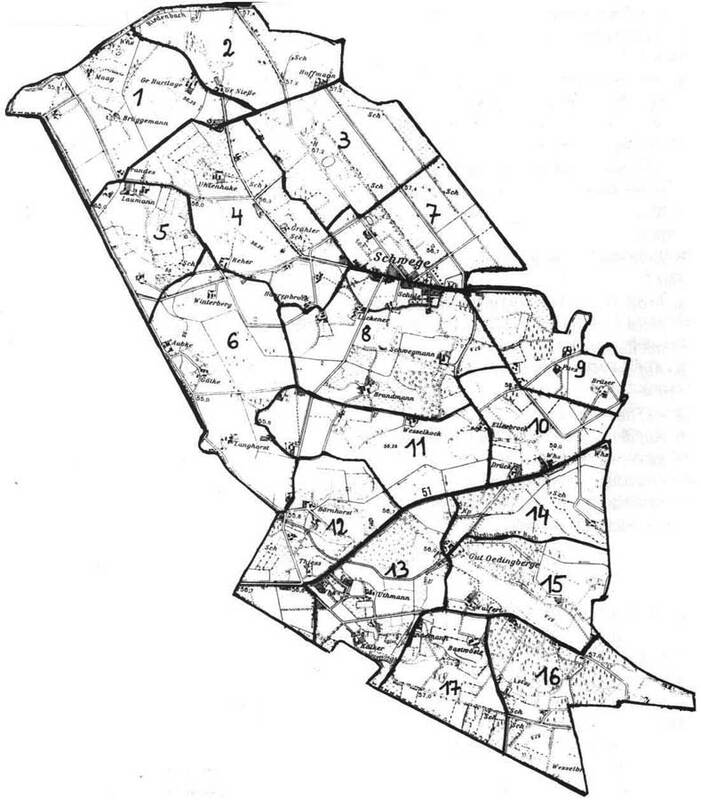 1850 Plat Map of District Glandorf-Schwege, showing the names of landowning families. On September 7, 1833, a pastor at St. John the Baptist Church in Glandorf, Father Johann Wilhelm Horstmann left for the United States on the ship Columbus. With him were seven others from his parish. They arrived in the new settlement by way of Detroit and purchased enough land from the government of the United States to accommodate the parishioners' families. This would be the beginnings of the town of Glandorf, Putnam County, Ohio. 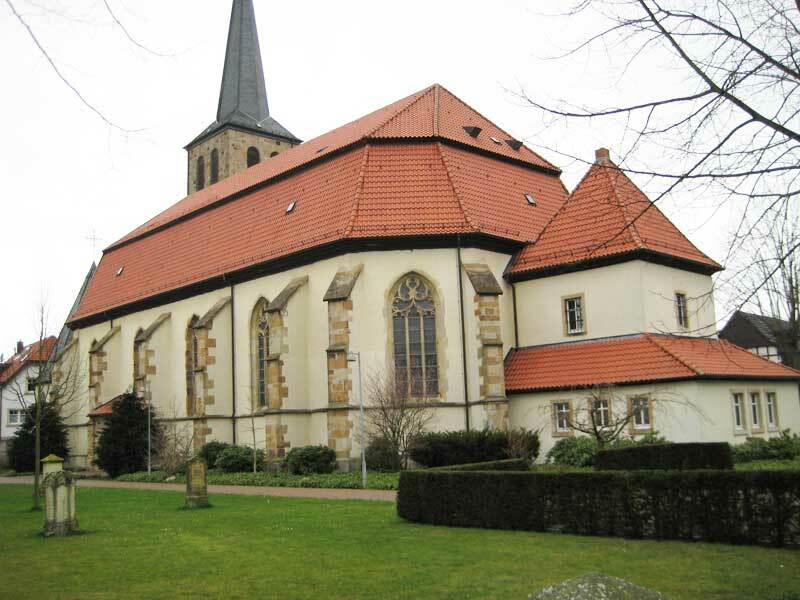 Father Horstmann was followed in successive years by a number of parishioners and their families from Schwege, including Ellerbrocks, Wortmanns and Unterbrinks. Johann Henrich Döpker followed in 1841. 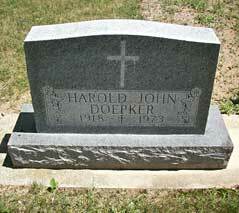 Anglicizing his name to John Henry Doepker, he was referred to as Henry. In 1843, he married Maria Anna Koester (who went by Anna) at St. John the Baptist Catholic Church in Glandorf. Also from Germany, she was fifteen years his junior and only seventeen when she married. 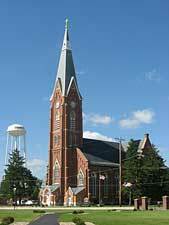 By 1850, they had moved to Ottawa, Ohio, about 5 miles from Glandorf, where Henry worked as a cooper (barrel maker). He also had two daughters, Caroline and Mathilda, 4 and 3 years of age, respectively. 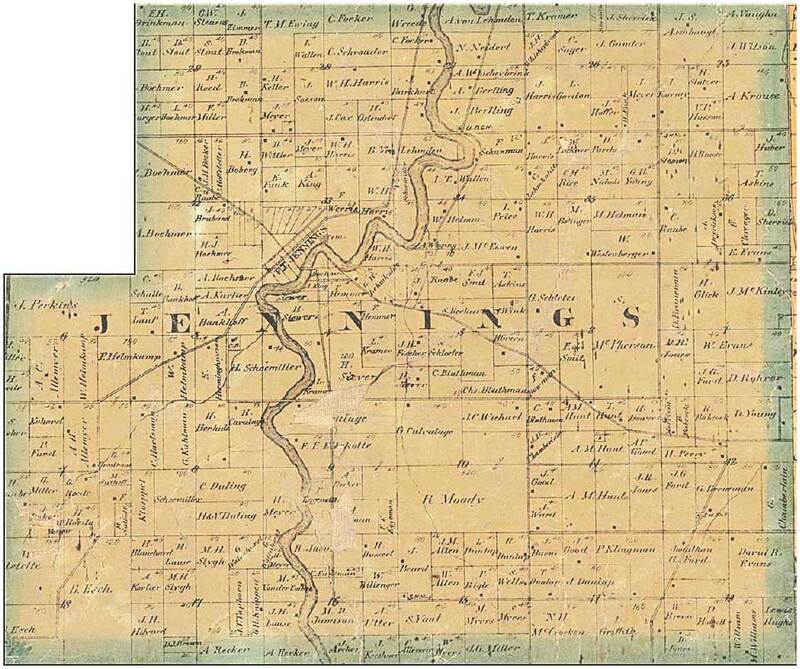 Eventually, Henry purchased enough land in Ottawa Township to begin farming (see the map below). He and Anna had three more children, Anna, Eberhart and Frank, all born between 1850 and 1857. Henry and Frank were still helping their father on the farm in 1870. The three daughters by that time had married and moved away. 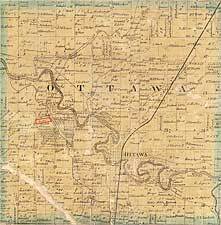 Caroline had married Bernard Wortman, a shoemaker, and was living in Ottawa. Christina married Frank Rampe, also a shoemaker, and was living next door to her parents. 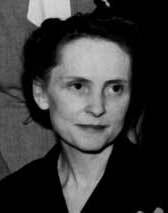 Mathilda had married John Bernard Krieger, a janitor, and was living near her sister Caroline in Ottawa. 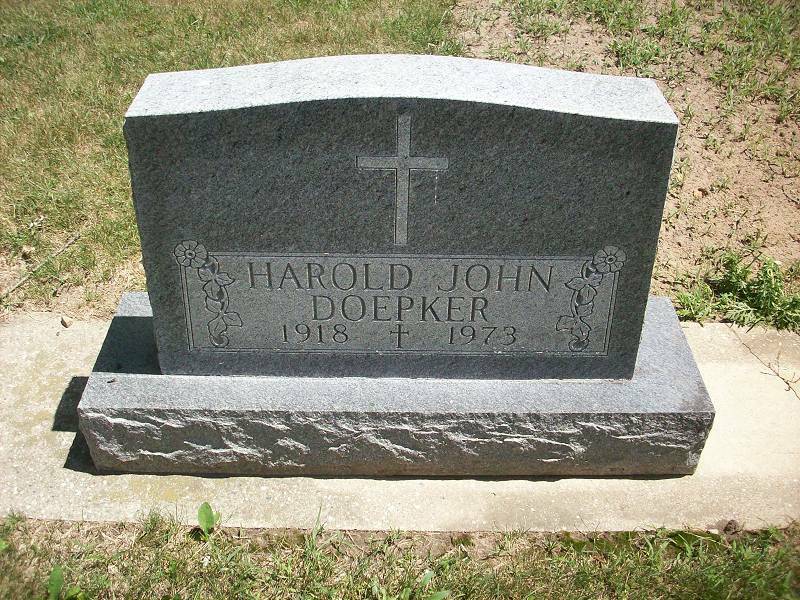 Eberhart Henry Doepker, who went by Henry, continued to live and farm with his father even after he had married Clara Schwartzengraber and had two children, Joseph and Mathias. Another son, John, did not live past infancy. Eberhart's mother Anna had died in 1874 and the elder Henry had not remarried, so Clara took up most of the household duties in the senior Doepker's home. Sadly, Clara would die young, in 1881, after only seven years of marriage. 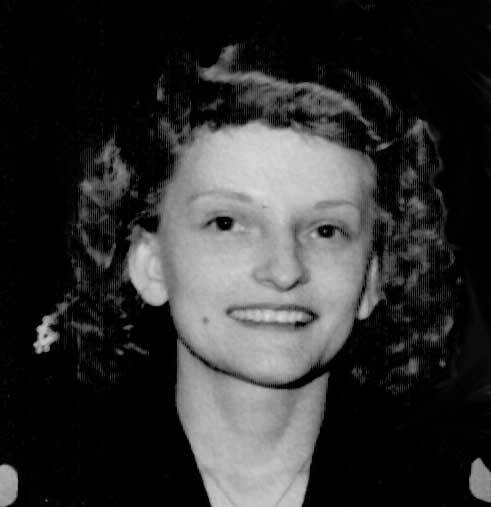 Eberhardt would marry for the second time the following year to Mary Ann Kramer. With her, he would have another nine children, many of whom lived well into old age. With such a large and growing family, it was clear that the land in Ottawa county, which, at 30 acres, had always been small, could not support every one of their children into adulthood. 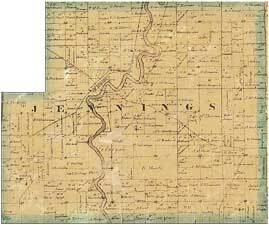 In 1886, Eberhart purchased 80 acres of farmland in Section 26 of Jennings Township, just northeast of the town of Fort Jennings, and moved his family there. It was a situation that was not to last. In 1909, Michigan's northern lower peninsula had opened up with offers of cheap, fertile land and the prospect of making a new start for Eberhart Henry Doepker. He set his sights on the small town of Shepherd, in Isabella County, which had been fully developed by then. 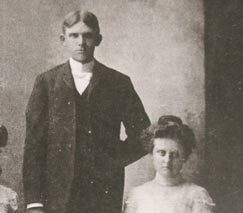 He, his eldest son by his second wife Edward, and the youngest son by his first wife Clara, Mathias, moved to the area and purchased land in Coe township. Edward and Matt lived to the southeast of town and Eberhart to the southwest. 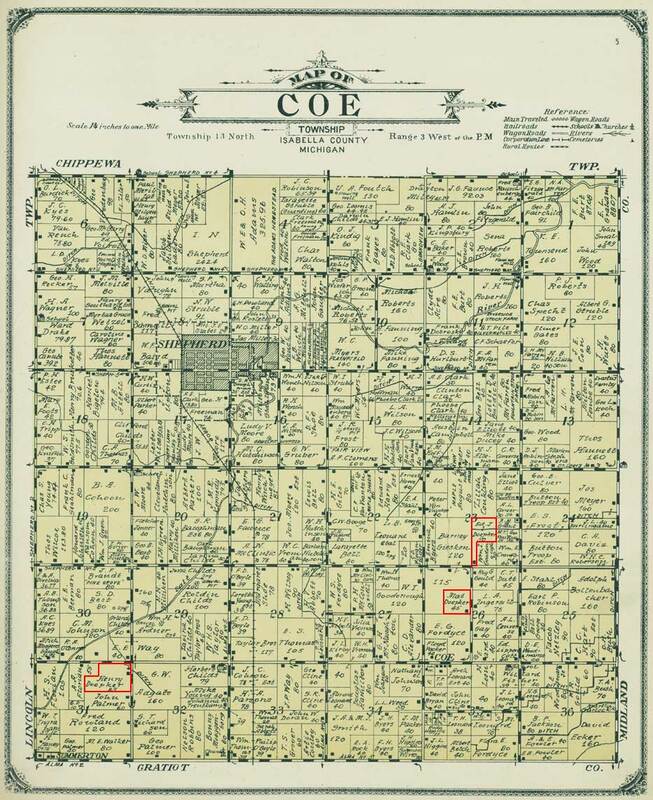 By 1915, Henry Doepker owned and farmed two parcels in Section 31 of Coe Township, totaling 85 acres, and lived at 11000 S. Leaton Road in Shepherd. Edward Doepker owned and farmed 50 acres in Section 23. Mathew Doepker (know simply as Matt) owned a 45 acre farm in Section 26, southeast Coe Township, and lived at 10450 S. Barnard Rd. in St. Louis. 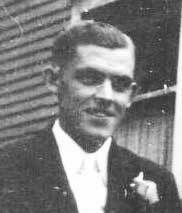 Matt, had married Anna Mary Bruskotter on May 27, 1903, at St. Joseph's Catholic Church in Fort Jennings at the age of 24, while still living with his family. His first child, Tillie, died prior to birth in 1904. Her twin Hildegard (my grandmother) somehow survived, as did the next nine, in order, Clara, Vincent, Villeta, Margaret, Norbert, Raymond, Harold, Dorothy, and Kathryn. 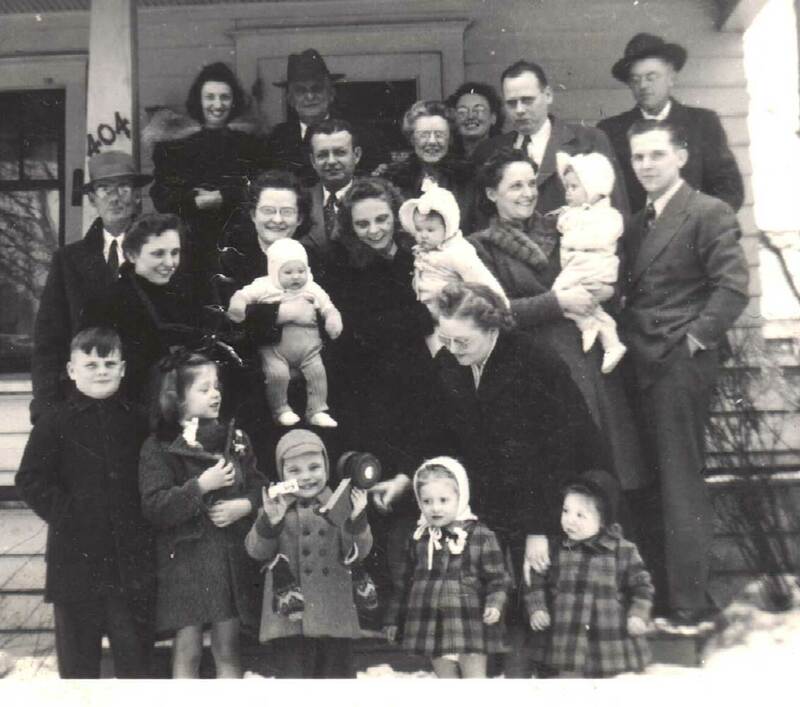 The first four children were born while the family still lived in Ohio with the last six being born in Michigan. Farming was a simple if difficult life at the beginning of the twentieth century. The years between 1900 and 1914 were profitable for many farmers as the value of both the crops and the land on which they were raised remained high. Further buoyed by the scarcity of both labor (from both military service and industrialization) and food during the First World War, many farmers over-leveraged their holdings. During this period of mass consolidation, farmers purchased many of their neighbor's farms as well as the new tools of mechanization then becoming widely available. With scarcity gone after the war, prices of both land and food collapsed, leading to the Farming Crisis of the 1920's when many small farmers, including the Doepkers, lost everything. By 1931, Henry, Edward and Matt Doepker's farms had all failed and been sold. Most of their family members moved to cities like Detroit, Flint and Lansing, to take advantage of the new jobs created by through America's post-war Industrial Revolution. The first settlement at the present site of Shepherd in Coe Township occurred in 1857, known as Salt River. A sawmill and flour mill were built by harnessing the waters of the Salt River at "the Corners." The first United States Post Office in Isabella County was established in the William Robbins home in 1857. The village of Salt River was platted by Elijah Moore on September 5, 1866. It consisted of two blocks and twenty-two lots. 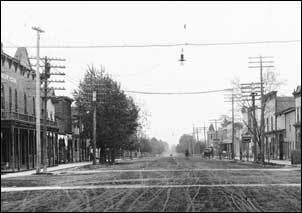 Mr. Moore erected a hotel which for many years was the only tavern in this part of Coe Township. George W. Miller platted an additional three blocks and forty-five lots in Salt River in 1867. 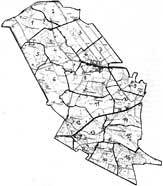 Miller and Moore continued to add to the town until 1870. The village had a log schoolhouse that was later replaced by a frame building. In 1885, Isaac N. Shepherd platted the village of Shepherd on land he owned west of Salt River. By the early 1890s, the principal businesses of Salt River had moved to Shepherd where the Lansing, Alma, Mt. Pleasant and Northern Rail Depot was located. Shepherd usurped Salt River's role as people moved nearer the depot and the thriving business community. Matt Doepker, ca. 1945 Matthew Doepker and Mary Bruskotter on their wedding day, May 27, 1903. 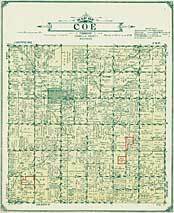 1915 Plat Map of Coe Twp, showing the farms of Matt, Henry and Edward Doepker. 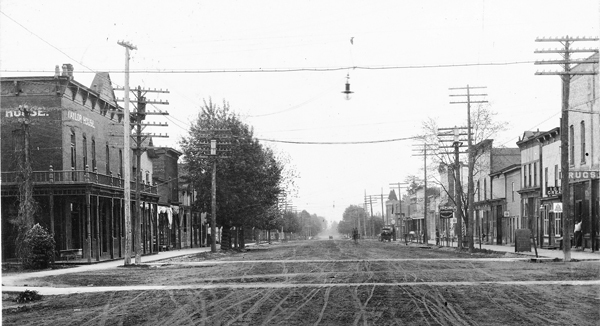 Downtown Shepherd, circa 1900. 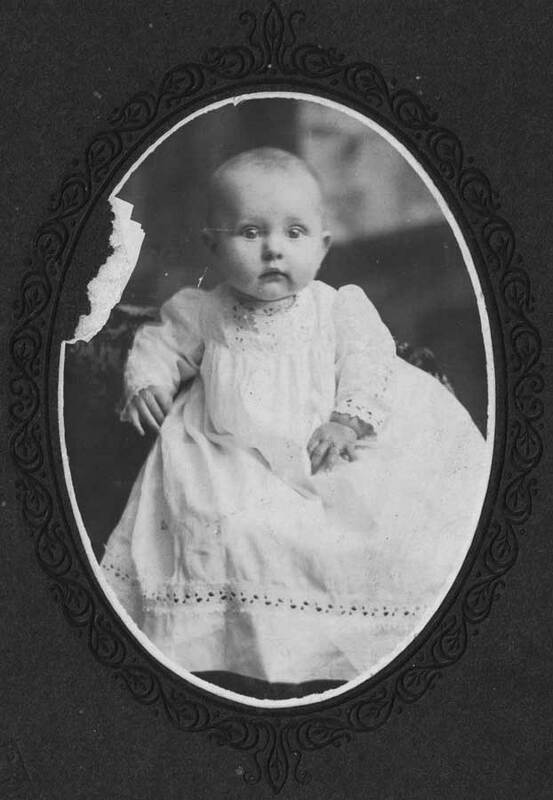 Hilda Mary Doepker was the second-born child of Matt Doepker and Anna Mary Bruskotter. Their first, Tillie, did not live past infancy. 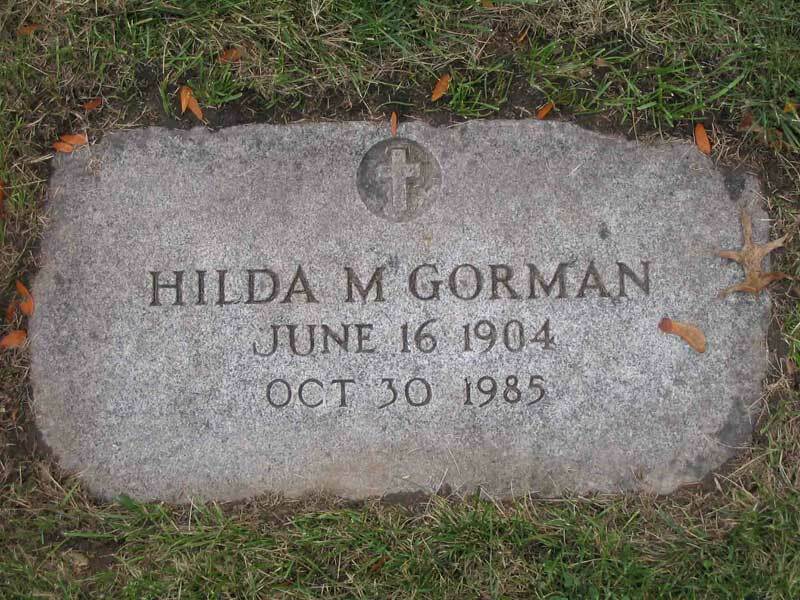 Born on June 14, 1904, Hilda would have a difficult life from the start. At a very young age, she contracted osteomyelitis, a bacterial infection of the bone tissue, in her elbow. Now treatable with antibiotics, the only treatment then was to physically, repeatedly remove any infected tissue and attempt to keep the site clean. She would spend many painful weeks at University of Michigan Hospital in Ann Arbor. Eventually, the infection completely destroyed her elbow joint, at which point the doctors told her that she had to choose what position she would like her arm in for it would remain there the rest of her life. She told them she would like it at a right angle so she could hang her purse from it. 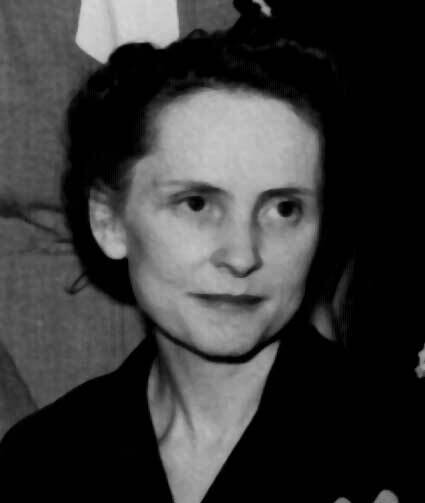 It would be the first of many illnesses, including polio, that were to plague her all her life. As a result of her difficult childhood, she never attended a formal school. As a young woman, Hilda was living at a monestary in Petosky, Michigan, preparing for life as a nun. When her medical expenses became too much for either the monestary or her family to afford, she was asked to leave so that she could become a ward of the state. She moved to Lansing and was hired to cook and clean at the house of Mabel Tynan (born Ann Marie Gorman). At that time, Mabel's brother Leo Gorman was living with her, in an arrangement of mutual support, following the death of scarlet fever of his first wife Rhoda Moriarty, and the death of Mabel's husband Frank Tynan from pneumonia. Leo fell in love with Hilda and proposed to her at her bedside in the hospital during one of her recurring bouts of illness. They married on June 6, 1934. Using a loan given to them by their pastor, they moved into a small house on Mechanic Street in Lansing, where she was to live the rest of her life. 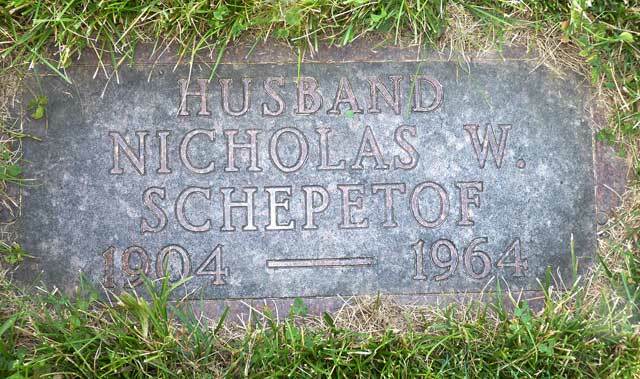 She had two sons, John Michael, born in 1936, and William Joseph, born in 1940. Leo worked two full-time jobs throughout most of their marriage while Hilda, health permitting, looked after the boys. Many doctors had said that she should have died many times over, but yet she persisted. Ironically, it would be Leo who would go first. 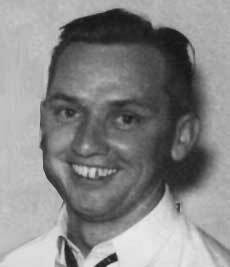 He succumbed to heart disease in 1954 after 22 years of marriage, leaving Hilda with John, 18, and Bill, 14. John continued to live with his mother until he married in 1960 and moved to Flint. 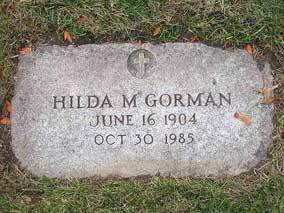 Hilda spent the next 20 years living in her home until her death in 1985. 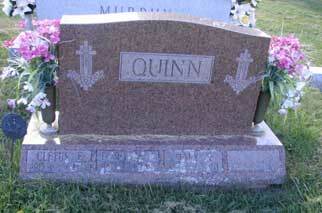 She is buried in St. Joseph Cemetery, Lansing, Michigan. I remember my grandmother Hilda as an incredibly sweet but frail woman who always had large, ulcerous sores on her legs. It had never occurred to me through my childhood that she had no ability to flex her left arm, she hid it so well. While usually serious, she had a good sense of humor and laughed heartily when the mood struck her. My earliest remembrances of her usually include her serving us Tang and windmill cookies as an afternoon snack when we visited. I sometimes credit her with developing my early interest in the arts when she let me use some plumber's putty to craft a small teapot. I think of her often, both fondly and pityingly, as she must have had a difficult and often lonely life. 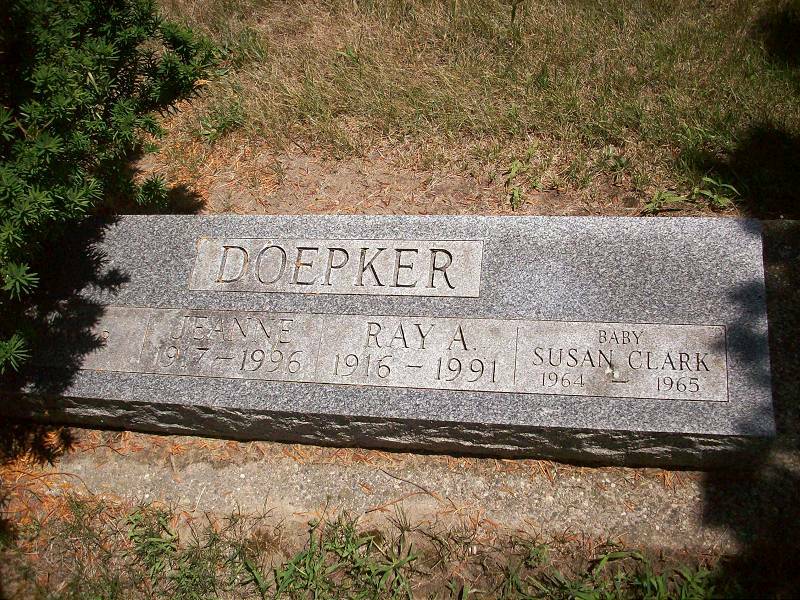 Clara Doepker was born June 21, 1906, in Kalida, Putnam County, Ohio, third eldest next to her sister Hilda. She was baptized 3 days later at Saint Michael's Catholic Church in Kalida. She moved, with her parents Matt and Anna; sisters Hilda and Villeta; and brother Vincent to Shepherd, Isabella County, Michigan, in 1909. She worked the family farm southwest of Shepherd while at school. She attended only through the eighth grade. 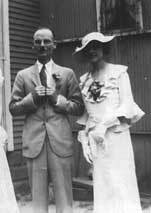 On January 22, 1932, Clara married Nicholas W. Schepetof. 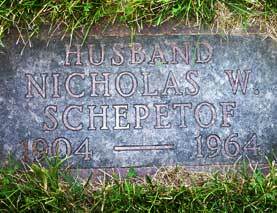 Known simply as Nick, he was born on July 6, 1904, in Warsaw, Poland, son and only child of Anton E. Schepetof from Warsaw and Amelia Smith from Russia. On his draft registration card for World War I, Anton Schepetof indicates he was from Russia, in contradiction to other records, but Russia had long since partitioned significant parts of Poland at the time of his birth. Nicholas emigrated with his parents to the United States in 1910 while still a child, eventually settling in Lansing, where they would spend the rest of their lives. He married Bernice Parker in 1923 at the age of nineteen, but the marriage ended in divorce less than nine years later. Clara and Nick never had any children. 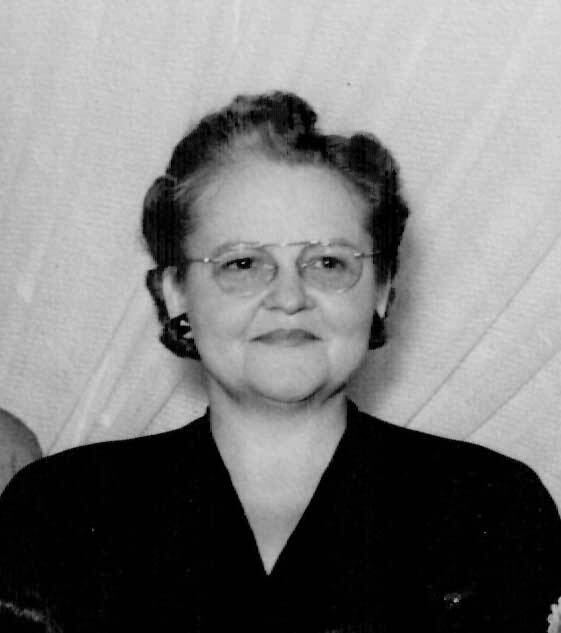 When still young, Clara worked sewing automobile seats at Oldsmobile. Nick was a salesman and later the owner of an appliance store. He was the manager of the Autobody Credit Union at the time of his death on March 1, 1964, at the age of 60. 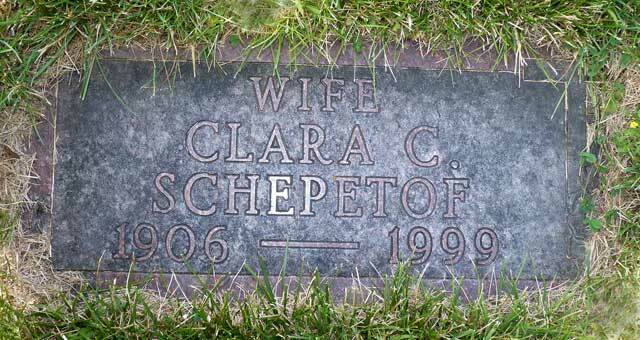 Clara outlived her husband by 35 years, dying on August 29, 1999. She never remarried. While diminutive in stature, Clara's personality filled a room. I saw her often when I was still a child and always remember her as one of my favorite aunts. 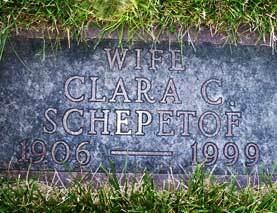 Both Clara and Nick Schepetof are buried in St. Joseph's Catholic Cemetery, Lansing. Vincent Louis Doepker was born October 26, 1907 in Kalida, Putnam County, Ohio, the fourth child of Matt and Anna Doepker. 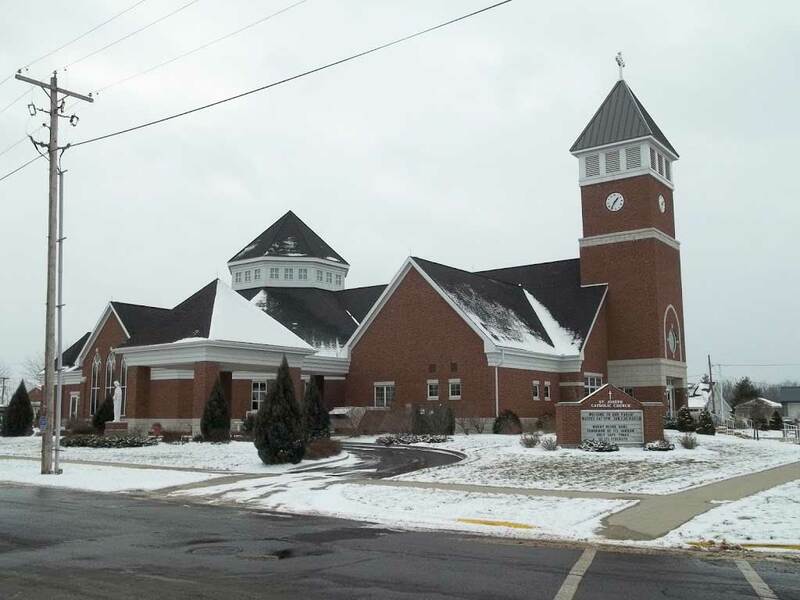 Like his sister Clara, he was baptized at St Michael's Catholic Church in Kalida, Ohio and moved with the family to Shepherd, Michigan when he was still a young child. Unlike many of his siblings, however, he would remain in Shepherd the remainder of his (albeit short) life, becoming a vital part of and business owner in the community. He attended Shepherd High School for three years but did not graduate. 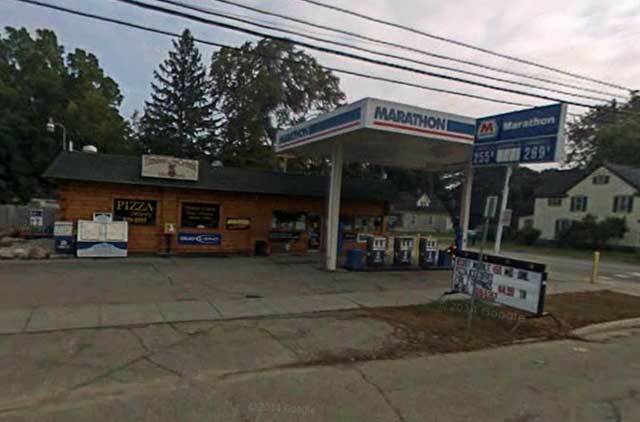 Vincent was owner of the Leonard Gas Station (now Timbercreek Marathon) at 197 East Wright Avenue, corner of Chippewa Street, in Shepherd, where his brothers Norbert and Harold also worked for a time. The parent company, Leonard Gas, was a refinery located in Alma, Michigan and operated a large number of stations throughout Michigan from 1936 through 1970 (for more on the Leonard Gas story, click here). Meanwhile, he continued to live with his parents on the family farm, at least through 1940. On November 26, 1940, at the age of 32, Vincent married Edith Irene Brown at St Vincent De Paul Catholic Church in Shepherd. 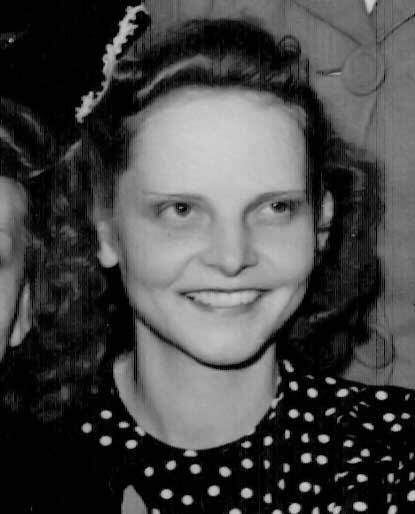 She was born June 29, 1918 in Shepherd to Walter Brown and Gertrude Bruskotter. She had been hired by Matt Doepker to help on the farm; presumably, this is how she met Vince. 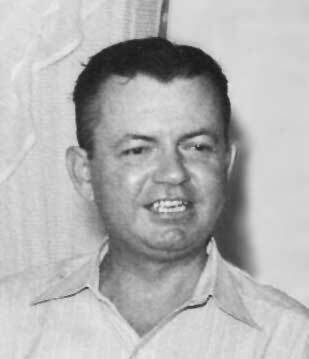 They had four children, Karen Ann, James David, Robert Vincent and Kay Irene, between 1943 and 1952. Their family were members of St. Vincent DePaul Catholic Church. 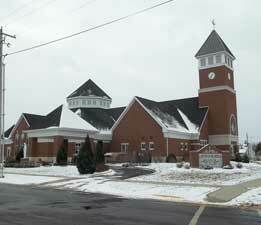 Vincent was a member of the Shepherd Knights of Columbus and the Holy Name Society. Vincent died rather suddenly of a heart attack on April 22, 1955 at the age of 47, when the oldest of his children was just 12. He was buried in St Vincent De Paul Catholic Cemetery. Irene went on to marry Vincent's younger brother Harold. Villeta Doepker, the fifth child of Matt and Anna Doepker, was born November 13, 1908 in Kalida, the last of the Doepker children to be born in Ohio, and was baptized in St Michael's Catholic Church. She graduated from Shepherd High School on June 10, 1926, the first of her siblings to do so. 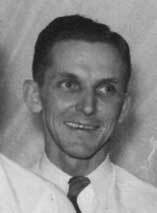 Villeta married Emerson Archer on June 12, 1937 and moved to Lansing. 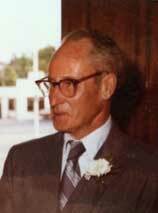 He was born on November 26, 1907, one of five children of Albert J. Archer and Hannah M. Reid, both originally from Ontario, Canada. Emerson's grandparents had emigrated from Canada and were farmers in Isabella township, just north of Shepherd. His parents had grown up there, eventually moving to Alma and then Lansing. Presumably, the connection with his grandparents was how he came to meet Villeta. In Lansing, they lived on South Clemens Street in the 8th Ward. He worked as an X-ray electrician in a hospital and she as a typist for the Secretary of State's Office for the State of Michigan. Their first child, Anne Margaret, was born in 1939, followed by Carol Jeanne in 1944. Carol Archer had only just completed high school when her father, Emerson, died on June 25th, 1963, at the age of 55. By then, Emerson and Villeta had moved to Tallahassee, Florida. He is buried there, in Roselawn Cemetery. He was joined by Villeta on March 20, 1990. She had never remarried after his death. I met Villeta only once within my recollection, when I was sixteen. She had a sparkling personality, a sharp wit, and a dog who loved to chase flies so much that he would stare for hours at a nail in the wall in hopes that it would take off and allow him to pursue it. 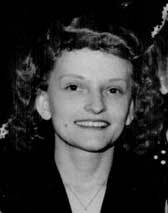 Margaret Doepker was born June 24,1912 in Shepherd, the first of the Doepker children to be born in Michigan. 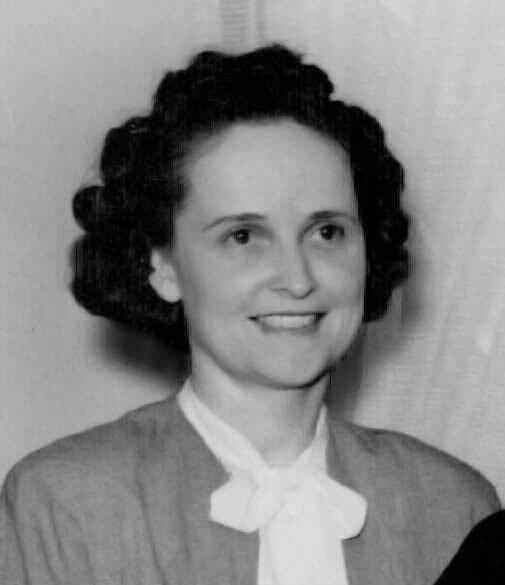 She attended Shepherd High school, graduating in 1930. 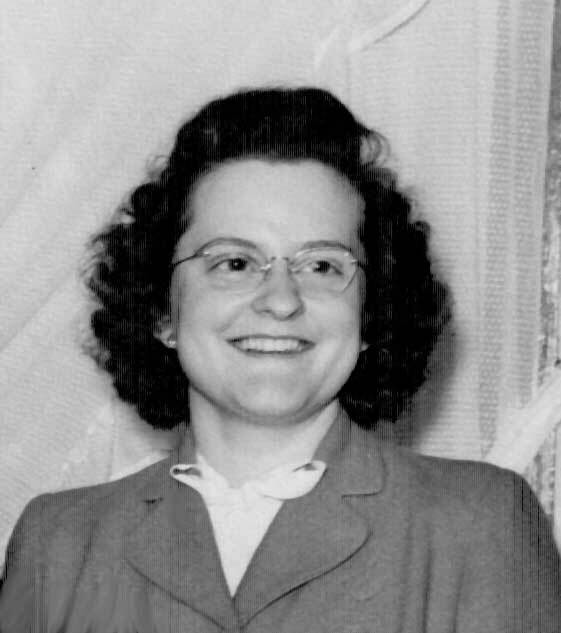 She attended nursing school at St. Lawrence Hospital School of Nursing in Lansing, became a Registered Nurse, and continued in that profession throughout the remainder of her life. 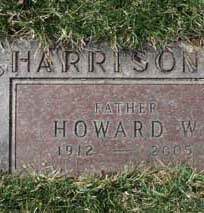 She settled in Lansing where she met Howard Harrison, who would become her husband. 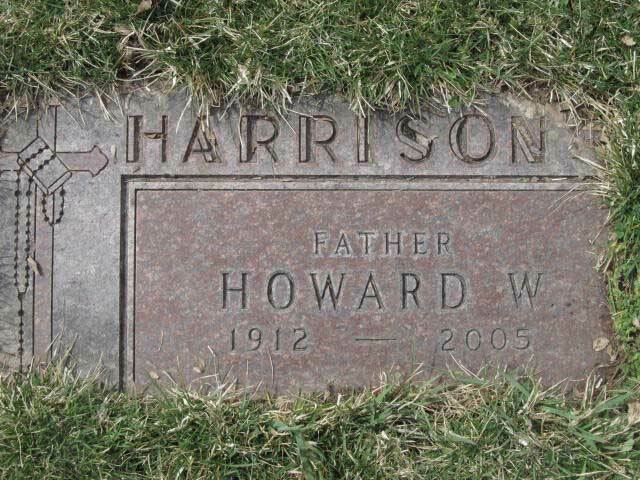 Howard Harrison was born on March 27, 1912, the son of George Wyman Harrison and Anna L Kelley, both originally from Lansing and of English, Irish and Scottish descent. Howard's father had died before he was seven years old, so his mother raised him and his siblings on her own. Howard attended high school until the eigth grade and went work as soon as possible in order to help support his family. He enlisted for service in the US Army Air Corps, but was discharged prior to the start of World War II. After the attack on Pearl Harbor, he was recalled and served in southeast Asia, primarily in India and Burma. 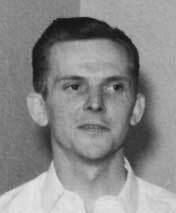 He was still in active service when he met and married Margaret Doepker on June 3, 1942 in Miami, FL. They started their family before the war was over. Their first child, Mary Lou, was born in Florida 1944, followed by Jean Ann in 1946 and Joseph William in 1951, each born in Lansing. Howard went into the trucking business, and became a member of Teamsters Local #580. Sadly, Margaret was not to enjoy a long life. She died on October 3, 1964 at the age of 52. 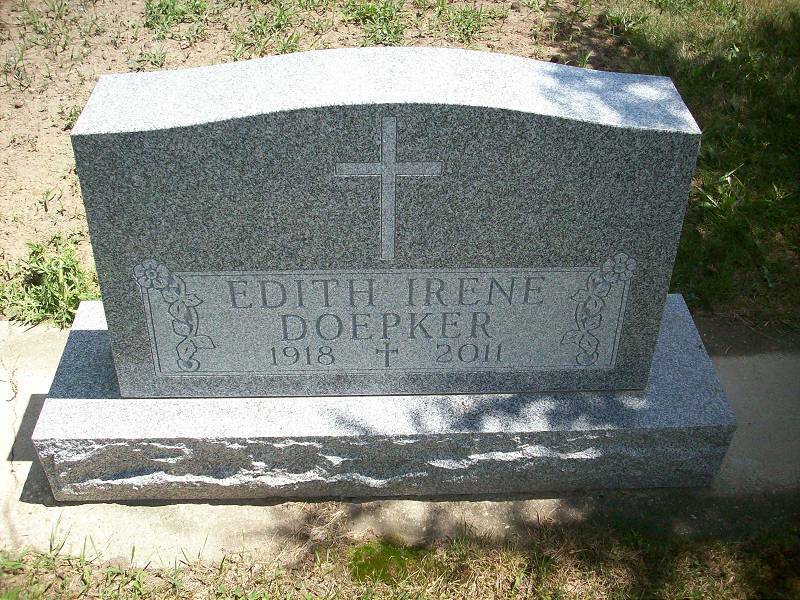 She was buried in St. Joseph's Catholic Cemetery in Lansing. Her youngest, Joseph, was just 13 at the time. Like his mother before him, Howard would have to continue to raise his children on his own. 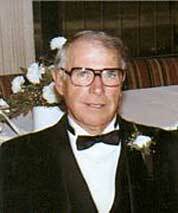 He never remarried and retired from C & J Driveaway (now C & J Logistics, Inc.) in 1974. He lived a long and full life - long enough to see his own children marry and have families of their own. 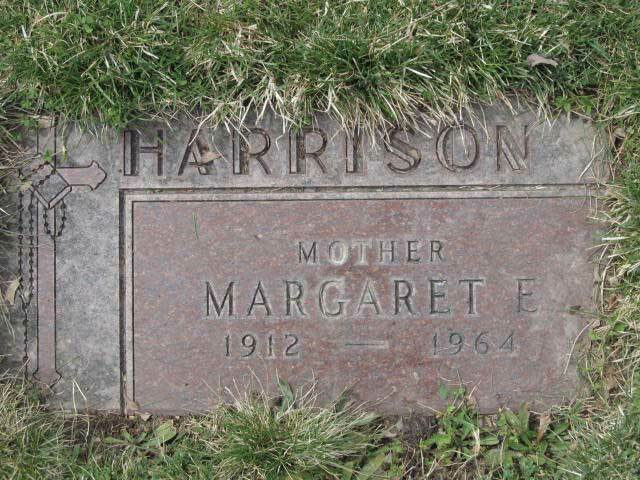 He died on January 5, 2005, at the age of 92, and was buried in St. Joseph's Catholic Cemetery, next to his beloved Margaret. 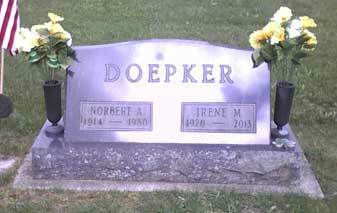 Bert Doepker was born April 20, 1914 in Shepherd. He attended primary school only through the eight grade, and did not attend high school. After spending his youth on the farm, he left in his twenties to work on a car assembly line in Detroit, but returned to Shepherd during the Depression. On January 15, 1941 (just after Pearl Harbor was attacked), he enlisted in the US Army at Fort Custer, Michigan, just west of Battle Creek. The terms of his enlistment indicate he was to serve for the duration of the war plus six months. 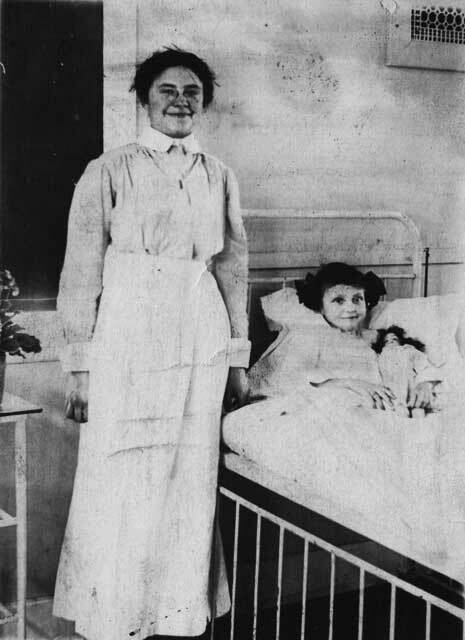 Upon his return home from service, Bert met Irene Margaret McCarthy in Sault Saint Marie, where she had been working at the War Memorial Hospital where Bert was being treated after the war. Bert and Irene married on October 26, 1946. 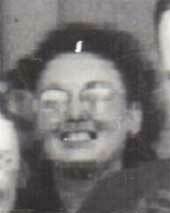 She had been born on June 29, 1920 in Pickford, Chippewa County, Michigan to Michael McCarthy, a millwright from Agela, Ontario, Canada, and Mildred Follis, a school teacher from Dafter, Michigan. One of nine children (that survived infancy), Irene was the second youngest. After marriage, Bert and Irene moved to Lansing, where Bert worked at Oldsmobile and Irene attended nursing school. 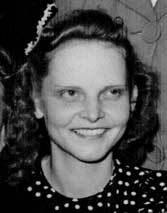 They had their first child, Sandra Kay, in 1948. In 1950, they bought a home and moved to 202 West Walnut Street in Carson City, Montcalm County, where they would spend the rest of their lives. Bert opened the B & I Bar and ran it for many years. 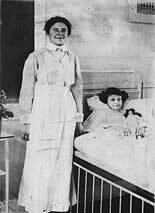 Upon completion of her studies, Irene became a Licensed Practical Nurse and went to work at Carson City Hospital. Their second child, David Matthew, was born in 1950, and their third, Diane, was born in 1952. Sandra Doepker would follow in her mother's footsteps and become an LPN. David Doepker became an ordained Catholic priest. Diane married and went to work at Herman Miller Furniture in Grand Rapids. The stress of running a business for many years, along with possible bouts of depression, finally took their toll on Bert. He committed suicide on July 16, 1980 at the age of 66. Irene continued to live in Carson Carson City and work at the hospital until her retirement. She passed away March 1, 2013. 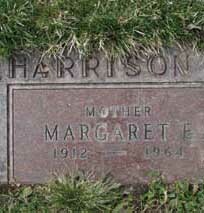 Both she and Bert were members of St. Mary's Catholic Church in Carson City and are buried in the adjoining cemetery. 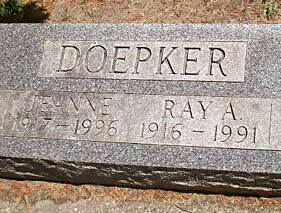 Ray Doepker was born April 3, 1916 in Shepherd, Michigan. He attended Shepherd High School for three years, but did not graduate. By 1940, he had moved out of the family home and was living on Orchard Avenue in Shepherd, at the home of Josephine Kirkconnell. 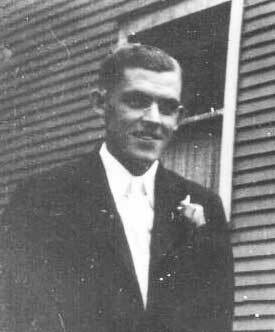 Meanwhile, he was working as a clerk at the Shepherd A & P Store, saving his money so that he could marry his high school sweetheart, another Shepherd native, Jeanne Richmond. 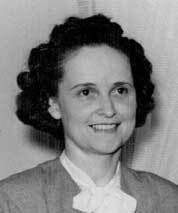 Jeanne A. Richmond was born March 25, 1917 in Shepherd to Milo Richmond and Fern Dubois, both Michigan natives. While she grew up in Shepherd, her family moved to Owosso between 1930 and 1940. Jeanne would finish her primary education at Owosso High School. Though they were living 60 miles away from each other, she and Ray would remain faithful and on October 26, 1940, they were married in Owosso. 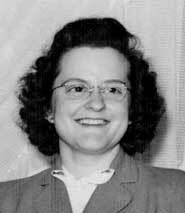 Irene was working as an inspector in an automobile assembly plant at the time and studying at Central Michigan University. Ray moved to Owosso soon after they were married and started working at the A & P in Owosso. Their first child, Pamela Jean, was born in 1942 followed by Sue Ann in 1945. Another child, Thomas Richmond, was born in 1954 but did not live past infancy. 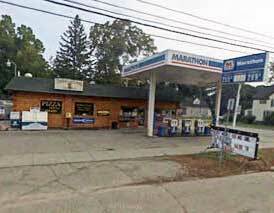 In 1953, Ray started working at Owosso Lyons Merchandise, where he would stay for the next 28 years. Jeanne worked at D.M. Christian's Department Store. In 1956, Ray and Jeanne purchased a home on 204 Goodhue Street in Owosso, where they would spend their remaining years together. Ray retired in 1981. Both he and Jeanne were members of St. Paul Catholic Church in Owosso. Ray was a member of the Owosso Elks Club and Knights of Columbus. 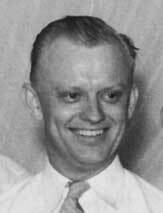 Ray died on May 28, 1991 at Owosso Memorial Hospital. Jeanne died on June 25, 1996 in Waterford, England. 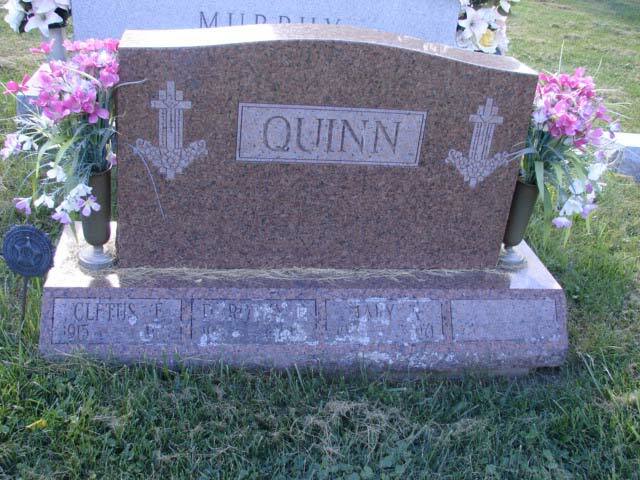 Both are buried beside each other in Saint Vincent de Paul Catholic Cemetery in Shepherd. I have very fond remembrances of Ray and Jeanne. Next to Clara Schepetof, I saw them the most of any of my grandmother's siblings. They were both incredibly kind, generous and good-humored and I always enjoyed seeing them. 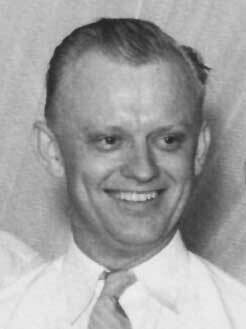 Ralph Doepker was born July 31, 1918 in Shepherd. He completed 2 years of high school but no more. In 1940, he moved to Detroit to find work and took up residence at 1966 Vinewood Avenue, in Ward 12, at the home of Ray and Agnes Nelson. 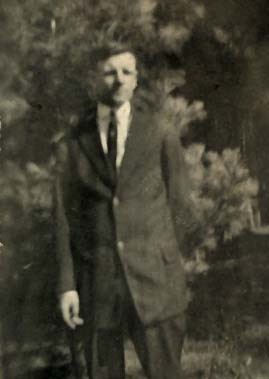 By all accounts, he continued to live in the Detroit area until his brother Vincent died, in 1955. 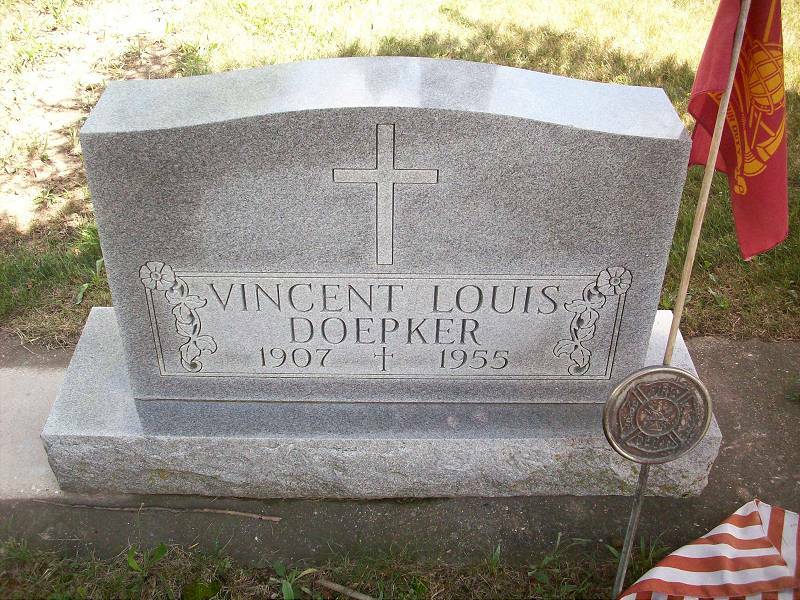 At that point, he returned to Shepherd and took over Vincent's business, the Leonard Gas Station, changing the name to Doepker's Service Station. It was also during this period that he got to know Vincent's widow, Irene (for more on her life, see Vincent's biography above) as well as help out her family, as the eldest of her four children was just twelve. Over time, they became very close and married on September 20, 1958. 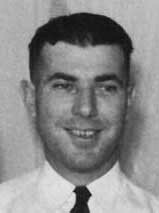 Ralph continued to live in Shepherd and operate Doepker's Service Station until his untimely death on July 20, 1973, just short of his 55th birthday, at Central Michigan Community Hospital, Mt Pleasant. He was buried in St. Vincent De Paul Catholic Cemetery in Shepherd. Irene remained in Shepherd and was an active participant and supporter of the Shepherd Maple Syrup Festival for many years after it was inaugurated in 1959. She died on March 4, 2011 at Ingham Regional Medical Center, Lansing and is buried in St. Vincent De Paul Cemetery next to the two brothers, both of whom she loved. 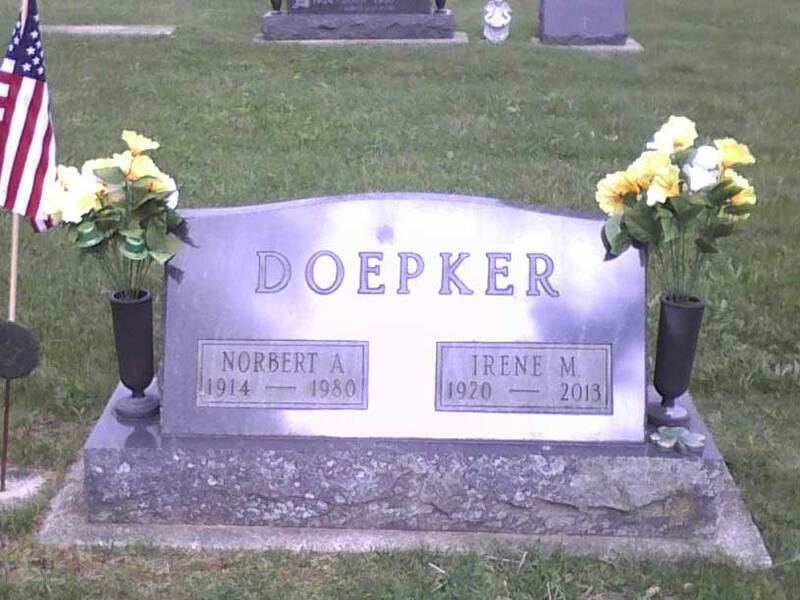 Dorothy Doepker was born on May 14, 1921 in Shepherd, the second youngest child of Matt and Anna Doepker. She attended Shepherd High School and graduated in 1940. She began dating Cletus Quinn (who preferred to be called Jake) not long out of school and saw both he and her brother off to war. 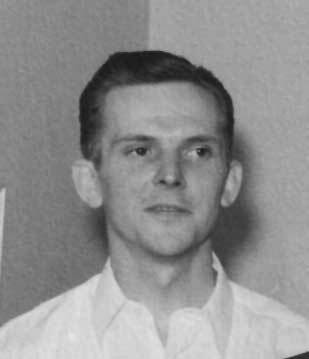 Cletus Francis Quinn was born on May 25, 1915, the second of thirteen children by Urban Ferdinand Quinn and Mary Louise Geisken. Jake's parents were farmers from Greensburg Township, Putnam County, Ohio, near the town of Glandorf. (Interestingly, this was the exact same place that Johann Heinrich Doepker, from whom Dorothy was descended, settled three generations earlier.) Jake made it through 2 years of high school but did not receive his diploma. By the time he was 24, he had moved to Shepherd, Michigan and was working as a mechanic at an automotive repair garage in town. Why he chose to move to Shepherd from Ohio is not clear, but it provided the opportunity to meet Dorothy. 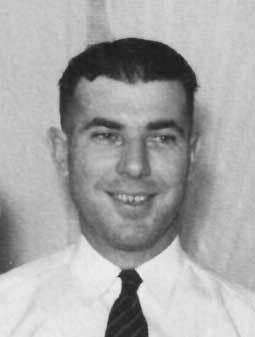 On January 15, 1942, Jake enlisted in the US Army the same day as Dorothy's brother Norbert, probably together. Jake spent more than two years overseas during the war. On his return, Dorothy was waiting for him at Fort Dix, New Jersey and they were married on the spot in a civil ceremony on May 25, 1944. They later had a church ceremony at St Vincent De Paul Catholic Church in Shepherd. 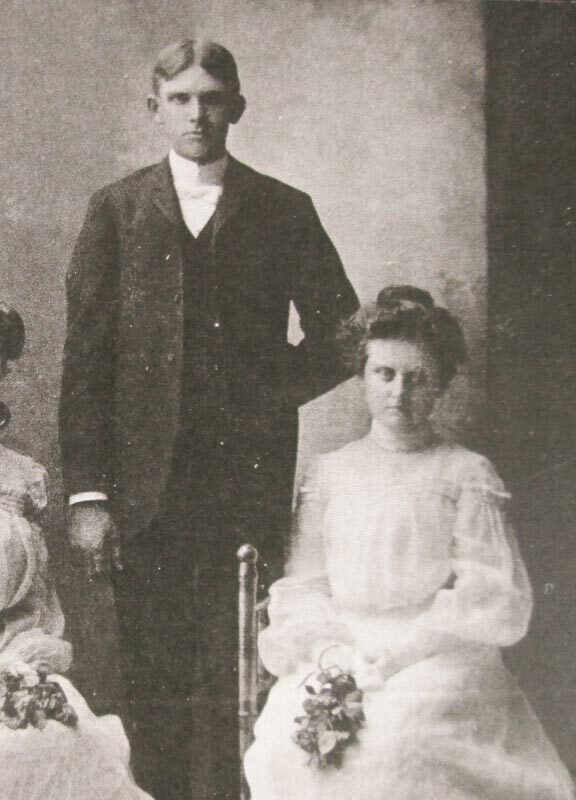 Not long after they were married, Dorothy and Jake moved to Alma, in Gratiot County, Michigan, eight miles south of Shepherd, where they remained the rest of their lives. 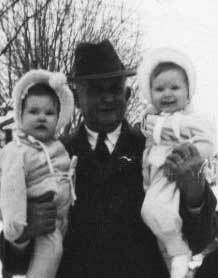 Their Daughter Mary Ann was born in 1946 followed by Michael James in 1948 and Judy Kay in 1952. Mary, sadly, died before her parents, on August 6, 1971 at the age of 25. Jake died of medullary paralysis (shutting down of the respiratory system) on February 22, 1976 at the age of 61. Dorothy died on December 7, 1985 at the age of 64. Both she and Jake are buried next to their daughter Mary in Riverside Cemetery, Alma. 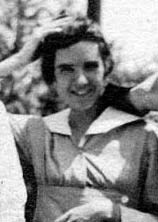 Kathryn was the youngest or the Doepker siblings, having been born on April 30, 1922. 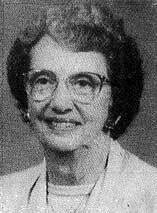 On February 3, 1951, she married Clare James Hogan. 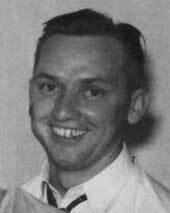 He was born on October 30, 1916 in Bloomer Township, Montcalm County, Michigan, the youngest of four children of John M. Hogan and Mary Barrett. John Hogan had been born and raised in North Plains Township, Ionia County, Michigan. 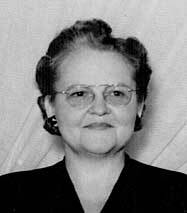 Mary Barrett was born in North Shade Township in Gratiot County. Both came from farming families and were farmers themselves. 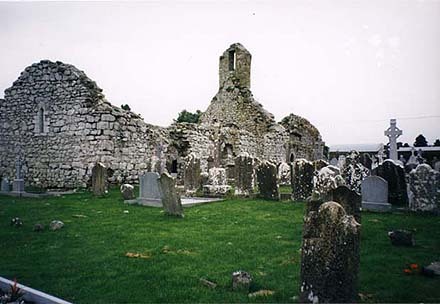 It would seem that farming was in Clare's blood. 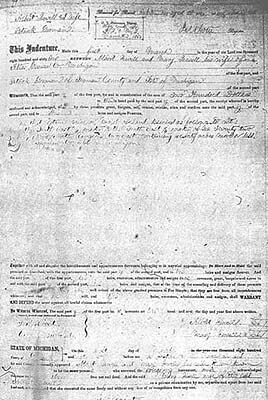 After Clare married Kathryn, they purchased land near Carson City, Michigan. 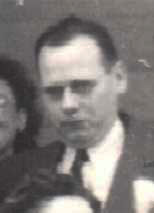 Their first child, Kathleen Ann, was born in 1955, followed by Colleen Marie in 1957, John Matthew in 1959, Ann Mary in 1961 and James Clare in 1965. 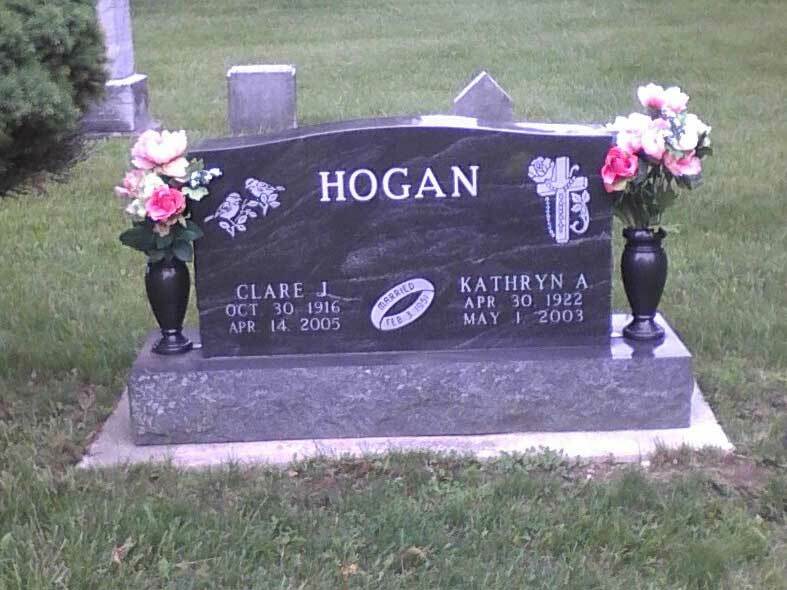 Kathryn Doepker-Hogan died of heart disease on May 1, 2003 in Carson City. 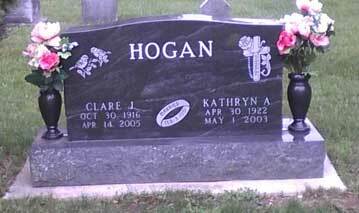 Clare Hogan died on April 14, 2005 at Rose Arbor Hospice, Kalamazoo, Michigan. They were buried beside each other in St Mary's Cemetery, Carson City.